TeslaIn its current iteration, Tesla’s Autopilot feature can keep a car in its lane and adjust its speed based on surrounding traffic, among other features. A TeslaAutopilot update set for August will include “full, self-driving features,” CEO Elon Musk said on Sunday. Musk didn’t say which self-driving features would be included, though he indicated the update would allow Tesla vehicles to perform better in areas where lanes merge on highways. He said the current version of Autopilot was most focused on safety, while the August update would introduce more autonomy. A Tesla Autopilot update set for August will enable “full, self-driving features,” CEO Elon Musk said on Sunday. Musk didn’t say which self-driving features would be included, though he indicated the update would allow Tesla vehicles to perform better in areas where lanes merge on highways. He announced the update on Twitter in response to a Twitter user who said his vehicle could not decide to allow a vehicle ahead of his to merge in front of him when lanes converged on a highway during heavy traffic. Musk said that issue would be addressed in the most current Autopilot update and “fully fixed” in the August update. He said the current version of Autopilot was most focused on safety, while the August update would introduce more autonomy. 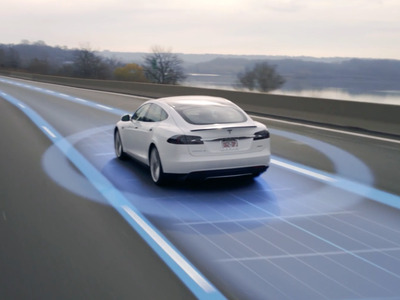 On Tesla’s website, it describes upcoming features – including the ability for a vehicle to change lanes without driver input, move from one freeway to another, and exit a freeway near the driver’s destination – that are not available in Autopilot’s current iteration. Tesla did not immediately respond when asked if those features would be included in the August update. On Tuesday, Musk said Tesla would give free trials of Autopilot to Tesla owners who didn’t purchase the feature (it costs between $US5,000-$US6,000) and have the necessary hardware to run it “hopefully next month.” Tesla last offered free trials of the feature in 2016. In its current iteration, Autopilot can keep a car in its lane and adjust its speed based on surrounding traffic, among other features. Recent accidents involving the feature have raised questions about whether drivers place too much trust in it and fail to pay attention to the road. Tesla has repeatedly said Autopilot is meant to be used with an attentive driver whose hands are on the wheel, but the most visible accidents involving Autopilot have included reports of distracted drivers. Tesla did not immediately respond when asked if the August update would allow drivers to remove their hands from the wheel when using Autopilot.